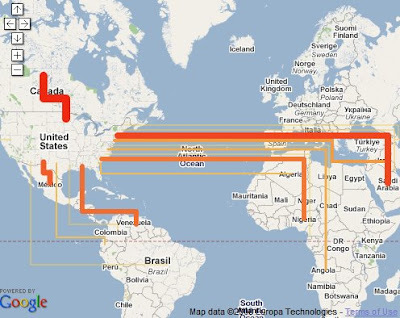 Google Lat Long: Where does our oil come from? There’s a great deal of talk about the high cost of oil and the billions of dollars that the US and other oil-importing nations spend each year to buy oil. As part of the Google.org Geo Challenge Grants Program, Rocky Mountain Institute (RMI) has created a map of US oil imports by country since 1973. By clicking on the green light to play, you can see the countries supplying oil to the U.S. (either in terms of barrels or dollar value) and how our imports have changed over the last 35 years. The thicker the line in the map, the more oil produced or imported. While this map highlights data on United States oil imports, the picture is similar for every oil-importing country in the world. The map also looks at potential oil from offshore drilling and exploration of the Alaska National Wildlife Refuge (ANWR). The screenshot below illustrates the impact of off-shore drilling. With the map zoomed or ‘drilled’ 3-5 levels down and centered near Alabama (and the map pushpin that represents offshore), check out the very thin line that shows the potential peak production of 220,000 barrels per day. The lines represent estimates of production in 20-30 years, and even with this very long timeline, the amount of oil that could be generated from offshore drilling is miniscule compared to our oil needs today. Today, along with the Brookings Institution, RMI is hosting “The Oil Solutions Initiative” a summit to identify solutions to break America’s dependence on oil, with Google in attendance. In 2004, RMI’s Chief Scientist, Chairman and Co-founder Amory Lovins and a team of RMI collaborators drafted Winning the Oil Endgame (PDF of the book) - a roadmap for the United States to get completely off oil by 2050. Google.org’s RechargeIT initiative is driving toward the commercialization of plug-in vehicles that can wean the US off gasoline. In our Clean Energy 2030 Plan we show that increasing conventional automobile mileage, deploying millions of plug-in hybrids and accelerating the turnover of the fleet would reduce oil consumption by 51% by 2030. That decrease would have an even larger effect on oil imports because we produce about one-third of our oil in the US. Google and RMI have worked together on a number of projects including RMI’s “Smart Garage” Charrette, a summit to identify the barriers and breakthroughs needed to electrify the U.S. auto fleet.